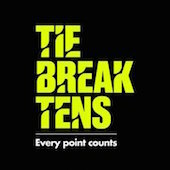 The Tie Break Tens series sees world-class players going head to head in fast-paced, action-packed knock out tournaments for a winner-takes-all prize of $250,000. Each Tie Break Tens tournament sees eight men and eight women battle it out in one thrilling three-and-a-half-hour tournament. Draw is out. Daniela starts against Coco Vandeweghe. Daniels starts with Coco Vandeweghe. Vandeweghe's currently ranked 17 and is the sort of power baseliner that gives Daniela's trouble. Daniela's the underdog but it'll be fun. I do believe that this is the first time Daniela has played in Madison Square Garden. They very modestly refer to the building as the world's most famous arena. Once Dani steps onto the court, that will become a true statement. Daniela was up 6-3, but lost 10-7 to Coco. Still got a fantastic dropshot. Daniela played well, she's still got her touch and skills but Vandeweghe had more power in the end. I especially enjoyed when Daniela played a dropshot and then lobbed Vandeweghe.